'A Twitter Year' In Review: 365 Days, 140 Characters Author Kate Bussmann doesn't turn on the TV when news breaks — she heads for Twitter. Her new book chronicles a year of cultural and political news through the widely used microblogging site. 2011 was a year of big news, beginning with the Arizona shooting of Rep. Gabby Giffords and ending with the sudden death of Kim Jong Il. Now, you could flip on the nightly news to find out what's going on in the world. Or, you could do what author Kate Bussmann does: Boot up Twitter. 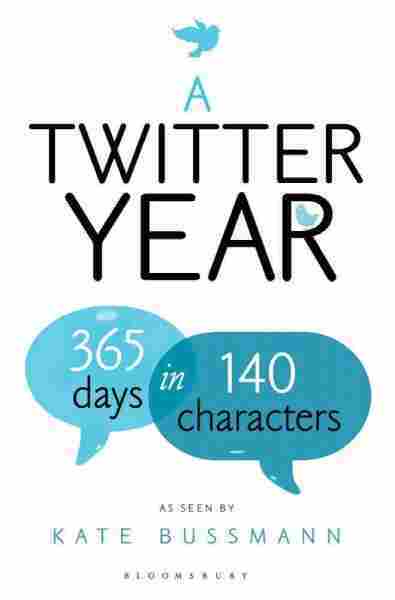 Bussmann is the author of a new book, A Twitter Year: 365 Days in 140 Characters, what she describes as the first-ever "social media almanac." She tells weekends on All Things Considered guest host Rebecca Sheir that Twitter gives her a unique perspective on the news. "There are so many incredible writers out there on Twitter and so many really compelling firsthand accounts of the big news stories this year that it makes for a really interesting way to recap some of those big events," Bussmann says. The big players, she says, are those who are experts at breaking news and increase their influence that way, or satirical accounts like one for Harry Potter villain Lord Voldemort. Bussmann says that instead of turning on her television, she goes to Twitter for breaking news. "I can get commentary from a lot of very, very interesting people simultaneously," Bussmann says. "And when you're watching live streaming news, often it's the very bare news that you're seeing, so on Twitter you have people analyzing every tiny detail." Bussmann says the popular microblogging service can turn a solitary activity, like watching television, into a lively social event. "I watch Glee sometimes," she says, but her husband "really does not get it and is not interested. If I watch Glee with Twitter on, when it's being broadcast live, I can follow the hashtag for Glee and see what people are saying." According to Bussmann, Twitter has released statistics showing that its usage in the U.S. goes up fortyfold during a live broadcast of Glee. Twitter has also been crucial to people struck by 2011's series of natural disasters. Bussmann says that in an emergency, when cellphone service is down, Twitter is often still functioning, enabling people to reach out to each other. During the Fukushima earthquake, she says, people used Twitter to call for help, both emotional and physical. "They would tweet ... what they were experiencing, and people across the world were writing back to them, saying, 'You'll be all right.' "
And after the earthquake in Christchurch, New Zealand, Bussmann says one man in San Francisco put out a call on Twitter for someone to check on his elderly father back home. "A total stranger saw this tweet and went to this man's house, found his father sitting outside in his car, safe, and tweeted back to this man in San Francisco and said, 'Your father's OK.' And it's the example of something that could not have happened without Twitter." "The Occupy movement was very interesting on Twitter," Bussmann says. "A lot of people used it in very interesting ways. They used it to get supplies sent to the squares where they were camping, and they used it to organize upcoming protests." But what about those holdouts who resist the lure of Twitter? "I'm sure that you can live a very fulfilling life without being on Twitter," Bussmann says. "I'm not saying you have to be on there, but there's a lot to be got out of it."